The paper discusses an advanced hybrid two-phase loop technology for spacecraft thermal management. The hybrid loop integrates active mechanical pumping with passive capillary pumping promising a reliable yet high performance cooling system. The advanced evaporator design using porous wick structures was developed for the hybrid loop to enhance boiling heat transfer by passive phase separation. The prototype testing using various hybrid loops and components demonstrated that the hybrid loop was capable of removing high heat fluxes from multiple heat sources with large surface areas up to 135 cm². Because of the passive capillary phase separation, the hybrid loop operation doesn’t require any active flow control of excess liquid in the evaporator, even at highly transient and asymmetrical heat inputs. These performance results represent significant improvements over state-of-the-art heat pipes, loop heat pipes and evaporative spray cooling devices in terms of performance, robustness and simplicity. Keywords: Heat Pipe, Evaporation, Two-phase, Thermal, Electronic, Cooling, Hybrid, Pump, Capillary. PACS: 44, 44.35.+c, 47.55.nb, 47.56.+r, 47.61.Jd. The widely-used two-phase cooling technologies for aerospace applications include heat pipes, loop heat pipes (LHP) and capillary pumped loops (CPL) which are all passive thus very reliable devices relying on only capillary pumping. However, the passive devices could not meet future challenging cooling demand in terms of heat flux, transport distance and multiple heat source capabilities (Ponnappan, Donovan and Chow, 2002). Recently, the pump-assisted two-phase cooling designs using micro-channel and spray have been developed for high performance cooling systems (Kawaji and Chung, 2003; Estes and Mudawar, 1995). The successful implementation of mechanical pumps used in the heat rejection system of the NASA’s Mars Exploration Rover somewhat confirmed the current technical trend of the increasing use of the active cooling design for space applications (Birur, 2006; Swanson and Butler, 2006). However, the potential reliability issues due to large pumping pressure, flow instability (for micro-channel design), complex fluid reconditioning and nozzle clogging/erosion (for spray design) significantly reduce the merit of the active designs. In the past years, the pump-assisted and capillary-driven (or hybrid) two-phase loop technologies have been developed to overcome such shortcomings of the aforementioned active two-phase systems (Ambrose et al., 1992; Masao, 2003; Zuo, Park and Sarraf, 2004; Park, Zou and Perez, 2005; Park, Zou and Rogers, 2005; Park, Vallury and Perez, 2006). Here, the hybrid two-phase loop using advanced evaporators with passive phase separation design was demonstrated to provide high performance cooling performance and robust two-phase loop operation. This paper presents an advanced Hybrid Two-Phase Loop (HTPL) technology which integrates active mechanical pumping with passive capillary pumping for electronics thermal management. The HTPL as illustrated in Figure 1 consists of an evaporator, a condenser, a liquid reservoir and a mechanical pump as the simplest configuration. The evaporator used for the HTPL has three fluid connections for a liquid inlet, an excess liquid outlet and a vapor outlet. The internal capillary structure of the evaporator can effectively distribute liquid in the evaporator while separating vapor from excess liquid thus maintaining the best boiling condition regardless of varying heat inputs. The evaporator has a planar form factor which is the most desirable for typical heat sources. Because of the use of active pumping, the hybrid loop can manage multiple evaporators in various configurations with long transport lines. FIGURE 2. 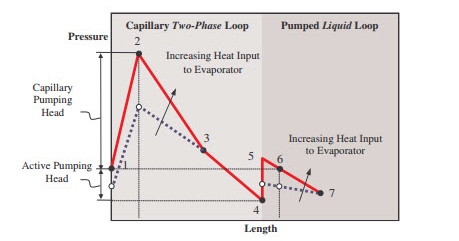 Pressure Profile of Hybrid Two-phase Loop as the Heat Input of Evaporator Increases. governs the operating temperature of the HTPL. The vapor generated from the evaporator is fed into the condenser and then to the reservoir through the two-phase loop. The excess liquid returns to the liquid reservoir through the separated liquid loop. Even though the overall system pressure drop is extended by the active pumping beyond the capillary pumping limit, the maximum heat flux will still be limited by the capillary capability of the wick structure of the evaporator. The schematic of the Hybrid Two-Phase Loop (HTPL) used for a thermal testing is shown in Figure 3. Main components for the HTPL include an evaporator, a reservoir, a mechanical pump and a condenser. For a clear characterization of the hybrid loop operation, single evaporator was used for the testing. The evaporator was made of copper and has a rectangular heat source area of 135 cm² (=7.6 cm×17.8 cm). 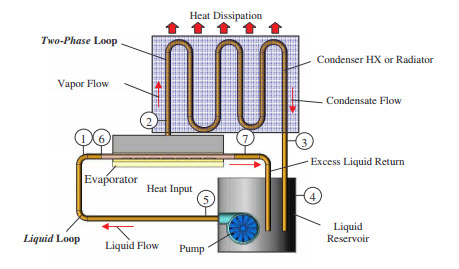 Three fluid connections of the liquid supply, excess liquid return and vapor exit as shown in Figures 1 and 3, are coupled to the evaporator. De-ionized water was used as a working fluid. The instrumentation used to monitor the hybrid loop operation includes pressure, flow rate and temperature sensors. The heat input into the evaporator was measured by a wattmeter. As further verification, the calorimetery was performed for both the condenser and reservoir. Prior to charging fluid, the entire system was thoroughly checked for any leaks using a helium mass-spectrometer leak checker. FIGURE 3. Schematic of Hybrid two-Phase Loop with Single Evaporator. The thermal test starts first by turning on the liquid pump to circulate liquid along the loop. Once the pump voltage was set to have a necessary liquid flow, the voltage was kept the same during the test regardless of varying heat inputs. Three electrical cartridge heaters were used to provide the heat input to the evaporator following pre-determined power schedules in which the heat input is incrementally increased from zero to a maximum and then decreased back to zero. At each power step, the system was allowed to reach steady-state conditions. Figures 4 to 7 show the test results using a maximum heat load of 2.5 kW (or the heat flux of 18.5 W/cm²). 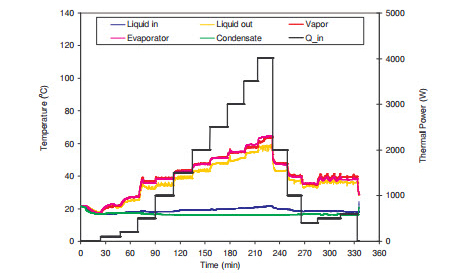 As shown in Figure 4, the evaporator temperature reached to about 55 °C at the maximum heat load while the vapor temperature was approximately 52 °C. The vapor temperature is much higher than the sub cooled liquid temperatures entering into the evaporator at 20 °C and leaving the evaporator at 46 °C. The temperature rise of the liquid flow is due to the “heat leakage” from the evaporator to liquid reservoir which is carried by the liquid flow unlike the loop heat pipes (LHP) having the similar heat leakage through the conduction. The temperature of the liquid supplied to the evaporator was close to the condensate. The condensate temperature was at 26 °C at the maximum heat load and approximately 21 °C at the lowest heat input. 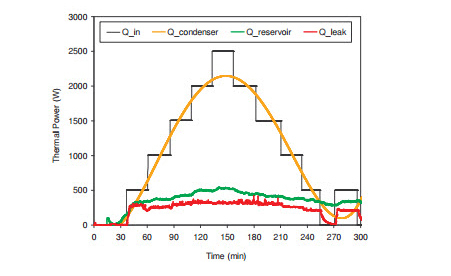 At the maximum heat input, the lower temperature of the liquid out of the reservoir than the condensate was due to the supplemental cooling using the“cooling loop #1” at the reservoir. 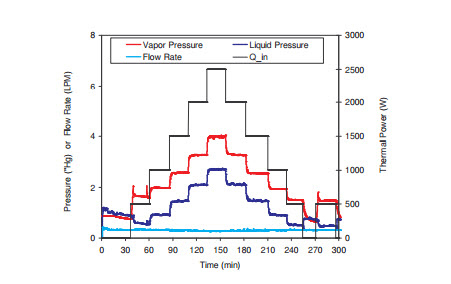 The measurement results of the pressure and liquid flow rate of the hybrid loop are shown in Figure 5. The vapor pressure in the evaporator was calculated from the measured vapor temperature using water saturation property table. The liquid pressure was averaged between the liquid inlet and outlet of the evaporator. In order for the hybrid loop to properly operate in capillary mode, the liquid pressure should be lower than the vapor pressure. During the test, the liquid supply from the pump was maintained to be around 0.3 LPM. The liquid flow rate was not affected by the variation in the heat load. The excess liquid flow rate at the maximum heat input was estimated about 60.7 % of the liquid supply which is the significant improvement over the evaporative spray cooling using much higher excess liquid, thus requiring large pumping system. FIGURE 4. Temperature Variations of Hybrid Two-Phase Loop vs. Heat Input. 500W during the power ramp-down. It indicates that the history of the heat input affects the subsequent boiling specially at lower heat inputs. In order to characterize the cold start operation and high heat flux capability in detail, the same hybrid loop was subject to a high power cycle up to 4,000 W (or the heat flux of 30 W/cm²) as shown in Figures 8 and 9. Figure 8 shows the temperature profiles of the hybrid loop. During the testing, only the heat input was incrementally increased up to 4,000 W, while keeping the pump voltage the same. The maximum heat input was limited by the electrical cartridge heaters for the evaporator. Considering the maximum evaporator temperature around 63.7 °C at the maximum heat input, much higher heat loads could be used without causing the evaporator dry-out. At the maximum heat load, the heat loss through the excess liquid return was measured to be about 11 % of the heat input. FIGURE 5. Pressure and Liquid Flow Rate Variations of Hybrid Two-Phase Loop vs. Heat Input. FIGURE 6. Calorimetery of hybrid Two-Phase Loop. 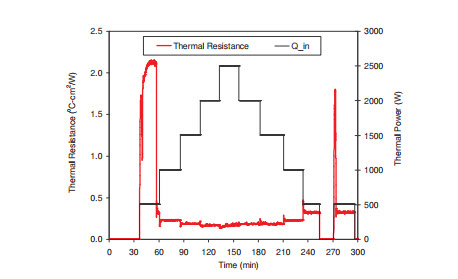 Figure 9 shows the thermal resistance of the evaporator. The higher thermal resistance at the cold start condition below 500 W indicates that there exists the nucleate boiling condition in the evaporator which was caused by the pre-existing liquid as similarly shown in Figure 7. On contrary, the high thermal resistance at 400 W before the end of the heat input cycle is caused by the liquid flood in the evaporator due to the higher liquid pressure than the vapor because of the insufficient evaporation heat. Therefore, the onset heat input for the fully-developed thin film boiling with low thermal resistance was estimated to be around 500W (or 3.7 W/cm²). FIGURE 7. Thermal Resistance Variations of Evaporator of Hybrid Two-Phase Loop vs. Heat Input. FIGURE 8. Temperature Variations of Hybrid Two-Phase Loop vs. Heat Input. To characterize the operation of the HTPL with multiple evaporators, a duel-evaporator hybrid loop was built and tested. 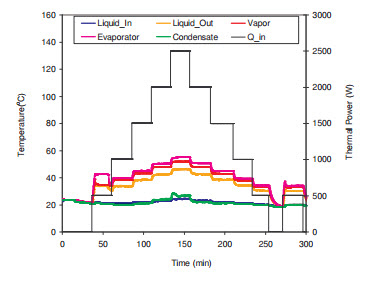 Figure 10 shows the test results of the dual-evaporator hybrid loop. The evaporators were captioned as “E1” and “E2” and connected in parallel in one loop. 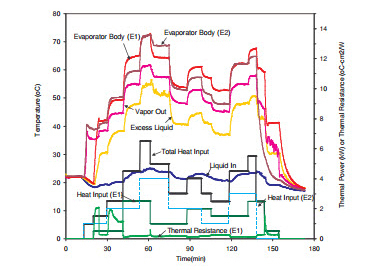 The evaporators were subjected to dissimilar heating schedules as shown in Figure 10. The strong interaction between two evaporators experiencing the different heat inputs is observed from the temperature results: the temperatures of the system are determined by both the individual and the total heat input. 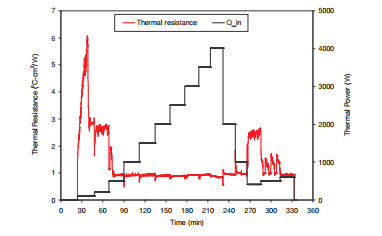 Figure 10 also shows the measured thermal resistances of two evaporators. The higher thermal resistance at the low heat inputs is caused by the liquid flood in the evaporator as already discussed in Figures 7 and 9. The evaporator thermal resistance is estimated to be as low as 0.68 °C-cm²/W at the higher heat inputs. Note that no active flow control was applied during the test using dual evaporators. FIGURE 9. Thermal Resistance of Evaporator of Hybrid Two-Phase Loop vs. Heat Input. FIGURE 10. Thermal Test Results of Dual-Evaporator Hybrid Two-Phase Loop. Advanced Hybrid Two-Phase Loop (HTPL) technology was demonstrated using prototype hybrid loops with either an evaporator or dual evaporators. The simple power cycle testing revealed that the HTPL was capable of managing multiple heat sources with the effective heat source area of 135 cm² (=7.6 cm × 17.8 cm) and large heat inputs up to 4 kW cooling load per evaporator which is equivalent to the heat flux up to 30 W/cm². The much higher heat flux capability is expected considering the low evaporator temperature. The measured evaporator thermal resistance was as low as 0.17 °C-cm²/W and remained relatively constant for various heat loads above 500 W (or 3.7 W/cm²). More complete understanding on the HTPL would require rigorous experimental testing and numerical analysis. The major achievements from this work are summarized as follows. High Heat Flux Capability: The hybrid two-phase loop using single evaporator managed high heat flux up to 30 W/cm². The much higher heat flux (>50 W/cm²) could be achieved considering the low evaporator temperature. Large Heat Source Cooling Capability: The evaporator with a large planar surface area of 135 cm² effectively performed passive capillary liquid management and vapor/liquid phase separation. The innovative evaporator design can be easily scalable to the high performance two-phase cooling applications requiring large area, high heat flux and various form factor heat sources. Multiple-Evaporator Operation: The hybrid two-phase loop demonstrated the operation of multiple-evaporator system. The anticipated interaction between two evaporators under an asymmetric heat input didn’t significantly affect the loop operation. Robust Operation and Simple Design: The hybrid two-phase loop demonstrated the superior two-phase cooling performance with low thermal resistances requiring no active flow control. The robust operation using simple design of the hybrid two-phase loop promises very reliable and compact cooling systems providing great design flexibility and excellent performance for various space applications under zero or reduced gravity. This work was performed under Army SBIR Phase II program. The authors wish to acknowledge the contributions of Mr. Jeff Reichl at ACT for his efforts in fabrication of the hybrid loop. Ambrose, J. H., Tung, J. H., Field, A. R. and Holmes, H. R., “Two-Phase Survivable Thermal Management – Heat Acquisition and Transport Components,” in the proceedings of SAE Aerospace Atlantic Conference, Dayton, Ohio, 1992, pp. 1-14. Gaj Birur, “JPL Advanced Thermal Control Technology Roadmap-2006,” in the proceedings of 17th Aerospace Spacecraft Thermal Control Workshop, El Segundo, California, 2006. Estes, K. and Mudawar, I., “Comparison of Two-Phase Electronic Cooling Using Free Jets and Sprays,” Journal of Electronic Packaging, 1995, Vol. 117, pp. 323-332. Masao Furukawa, “Multi-Purpose Mechanical/Capillary Hybrid Pump Loop,” in proceedings of 33rd International Conference on Environmental Systems (ICES), Vancouver, British Columbia, Canada, 2003, paper no. SAE 2003-01-2388. Ponnappan, R., Donovan, B. and Chow, L., “High Power Thermal Management Issues in Space-Based Systems,” in the proceedings of Space Technology and Applications International Forum (STAIF 2002), edited by M.S. El-Genk, AIP Conf. proceedings 608, Melville, NY, 2002, pp. 65-72. Kawaji, M. and Chung, P.M.Y., “Unique Characteristics of Adiabatic Gas-Liquid Flows in Microchannels: Diameter and Shape Effects on Flow Patterns, Void Fraction and Pressure Drop,” Journal of Microscale Thermophysical Engineering, 2004, Vol. 8, No. 3, pp. 239-257. Park, C., Zuo, J. and Perez, J., “Advanced Hybrid Loop Technology for High Heat Flux Laser Cooling,” in the proceedings of 3rd International Energy Conversion Engineering Conference, San Francisco, California, 2005, paper no. AIAA 2005-5696. Park, C., Zuo, Z. J., Rogers P. and Perez, J., “Two-Phase Flow Cooling for Vehicle Thermal Management,” 2005 SAE World Congress, Detroit, Michigan, 2005, paper no. SAE-2005-01-1769. Park C., Vallury A. and Perez, J., “Advanced hybrid cooling loop technology for high performance thermal management,” in the proceedings of 4th International Energy Conversion Engineering Conference, San Diego, California, 2006, paper no. AIAA 2006- 4059. Zuo, J., Park, C. and Sarraf, D., “Hybrid Loop Cooling of High Heat Flux Components,” in the proceedings of 2nd International Energy Conversion Engineering Conference, Providence, Rhode Island, 2004, paper no. AIAA 2004-5612. Swanson T. and Butler D., “NASA/Goddard Thermal Control Technology Roadmap-2006,” in the proceedings of 17th Aerospace Spacecraft Thermal Control Workshop, El Segundo, California, 2006.